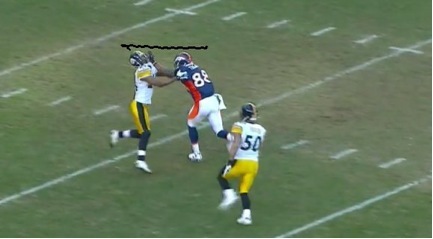 Scouting the 2012 Broncos: Deeps and drops - It's All Over, Fat Man! After a recent reader comment, I was drawn to looking at the drop rates of Denver receivers. Eric Decker, for example, had nine drops over the course of the regular season, and one in the WC game against Pittsburgh. It struck me that this was a high number for him. I didn’t know the background of Demaryius Thomas in terms of this stat, but I knew Decker had a very low drop rate in college. Since Peyton Manning doesn’t suffer mistakes kindly, drop rates would be one area that would matter over the 2012 season. Manning has also been consistent about his criteria over the years - if you get open, you get the ball. If you drop it, you might not be as open as you thought next time around. I decided to look. I took a while to look over the receiving stats for both Thomas and Decker over the course of the 2010 and 2011 seasons. I wanted to find out what their drop rate had been previously and what they were last year, and I was also interested in their outcomes with the deep pass. The ability to create explosive plays - 12+ yards on the ground, 18+ through the air - is one of the essential aspects of creating a winner and there’s nothing more explosive than a long touchdown. Drops, on the other hand, can deflate a drive in a moment. While the sample size would be somewhat small, I knew that Thomas had played in an option offense at Georgia Tech, and a great deal of what he did for that offense was to get free deep. He wasn’t really taught the whole route tree, although he became a very good blocker as part of his role in that style of offense. You’re gonna have to run the whole route tree now. I was excited at the same time, but I was kind of nervous, because from watching him I felt like he — I ain’t gonna say he was demanding — but the receivers did the right things and he got the ball to them in the right spots. So to get to play with a future Hall of Famer, I knew I had to step my game up and get in my book more, run routes more, because I never really ran routes much. So I thought it was gonna be a challenge, and it has been so far. But it’s been good, too. This is a wonderful chance for both Decker and Thomas to learn receiving from one of the most knowledgeable quarterbacks in the history of the game. It’s true for both receivers in the weight room, the film room and on the field - Decker and Thomas have a chance to expand their knowledge of the game exponentially. When a team has multiple weapons that are effective deep vertically, it puts a larger weight on the defense. That’s currently true of Denver, a team that obtained two of its starting receivers in the 2010 Draft, when both Thomas and Decker came to the Broncos. Both players had pre-existing lower limb injuries when Denver drafted them, and have dealt with additional injuries since then; both appear to be fine going into training camp. This is the first year they are both healthy going into camp, and the quarterback situation is also finally settled. It doesn’t hurt that Denver now boasts one of the finest throwers in NFL history. Three of Decker's nine drops came during the first five games of the year with Kyle Orton as the quarterback, with the other six occurring with Tim Tebow at the helm. Another drop came during the postseason. That’s not the kind of performance that I expected from Decker, who has a history of Velcro hands. It’s not news that the receivers had trouble with Tebow’s passes, though. I started to explore more. But on deep passes, Decker became more reliable according to PFF's accounting; he was targeted deep (20 or more yards) seven times, and three of those balls were considered catchable. He caught all three of them. In 2010, he was only targeted eight times overall, with six catches and drop. Of those eight, he caught two of three passes in the deep middle, for 66 yards and no drops. His deep ball skills do stand out in a positive way, despite the fact that the sample size is small. He has turned his catches into touchdowns at a high rate so far, with one TD among those eight receptions in 2010 and eight scores out of 44 receptions in 2011. What’s interesting to me is that his college production while starting for three seasons at the University of Minnesota included eleven career 100-yard receiving games and he was targeted 354 times, dropping only three passes (0.8%) over that span. That’s a rare performance. Decker also set Gophers career records with 227 total receptions and 3,119 receiving yards. Those stats also rank sixth and eighth, respectively, in Big Ten Conference history, with only three drops over that time period. He’s obviously got a very high upside in this respect. What does that suggest with Peyton Manning as the quarterback? Manning reads defenses like some folks read manga - quickly, easily and with considerable interest. His verbal adjustments are one of his many strengths, due to years of intense study of the tendencies of teams, defensive coordinators, and specific defenders. 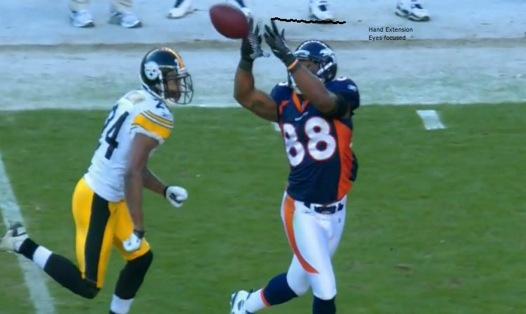 If Decker gets open, Manning’s legendary accuracy is likely to find him with catchable passes on a very regular basis. According to PFF, Manning was accurate on 39.9% of his deep passes from 2008-2010, a major upgrade over the 31.7% figure posted by Tebow last season. I believe that Manning can do even better with these two receivers. Since backup Adam Weber was Decker’s QB at Minnesota, it’s probably fair to assume that Manning’s accuracy is better than that of Decker’s college compatriot. Manning also tends to have a very catchable pass - some quarterbacks do, some don’t. John Elway has commented that learning to take a little off his own passes led to fewer broken and dislocated fingers by his receivers, which they appreciated. Given that Manning has good touch and generally has exceptional accuracy on his passes, Decker’s and Thomas’s skill at catching the long pass should be greatly appreciated - and used. Demaryius started out his career in 2010 with 22 receptions on 37 targets for a 59.5% completion rate, along with two touchdowns; he had two dropped passes over that span. He was targeted for deep (20+ yards) six times and had two catches with zero drops. In 2011, he was targeted 65 times and had 32 receptions (regular season), a 49.2% completion rate. 10 more receptions on 16 targets came in the two postseason games, with four against Pittsburgh and six against New England. He had been targeted for the deep ball 22 times in total for 2011 (regular and postseason) and caught 12 of them with only a single drop, which is an unusually high percentage of catches for the deep reception. He brought in catches of 25 yards or more in seven of his final eleven games of the year. I thought that this shows off Bey Bey’s game pretty well: at the beginning of the second quarter, Denver gets the ball back after holding the Steelers to their second field goal. 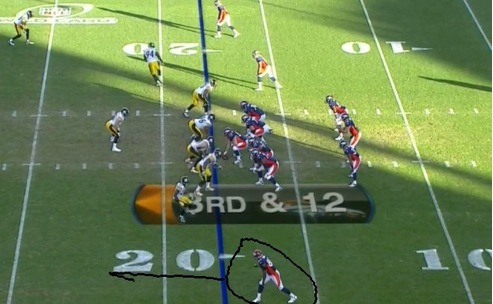 On third and 12, Tebow takes the ball from the shotgun in a pro set, with two running backs, one on either side of him. There are three WRs, so the front five of the offensive line has to be strong. Thomas is in the X receiver’s role. It takes all seven protectors (five OL and two RB) on that play to keep Tebow off the turf. Tebow tries to find an open receiver more than once, but his protectors are stout. Thomas runs a simple route, just a hitch and go into off coverage. Ike Taylor, in coverage, loses him for a moment, and in trying to recover, he turns back toward the sideline and bounces off of Thomas, who uses that and takes away the inside on the route. Thomas uses the chance to cut into a slant - Taylor’s move to recover puts him out of position, and now he’s chasing Thomas. The pass is slightly inside and behind Thomas, but he uses his hands well and pulls in the ball. ...but Taylor holds on grimly, dragging Thomas to the ground as help arrives a few moments late. Perfect technique by Demaryius. It shows how well DT tracks the ball over his shoulder, his form on the catch, and how hard it is to bring him down one on one. Between Eric Decker and Demaryius Thomas, the combination of size, speed, and good hands should provide Manning with some easy opportunities, and the Broncos with substantially more than the average of 19.3 points per game that 2011 brought them. I’d expect both players, plus tight end Jacob Tamme and whoever else Denver decides to keep out of the excellent WR and TE corps that’s available, to be successful. Manning will be throwing it short, medium and long: he’ll have no shortage of targets. I understand that the no huddle in Denver will gas the defense, but if that's the case, why hasn't Denver always run a no huddle? I guess it's because we've never had a QB with the capability of running one like Manning? I have to think that Elway could have been able to do it. I guess my point was that I hadn't seen anyone from the Broncos actually say they were going to use it but the Media just assumed they would based on Manning's past. If you guys have seen somewhere that says they will run it, then that's good enough for me. I'm glad the Broncos will finally be utilizing the high altitude to their advantage. The point about the defense not being able to substitute was good. I was familiar with that concept, but hadn't quite connected it to our Broncos yet. Thanks Ivan and Doc. probably Thompson then, he was a redshirt Junior at UF when Tebow left and Brantley took over. Magster - yes, they do. They're labeled 'uncatchable'. Some stat sites track it, some don't. I looked it up with both of these guys, though. It's in the stats given. I would think the NO huddle at mile high will gas the defenses in a heart beat. I see loads of time outs taken just to change the personnel, before heart attacks happen. Which of course will severely limit them when they need them down the stretch.. WIN WIN.. IMO.. Thanks Doc, Good read. I'm stoked to see this offense. I wonder if another problem with Decker and Thomas catching balls is the style of offense. It seems like it might be hard for a receiver to remain engaged when they know there are only going to be about 12 catchable passes thrown. "Whats that in the air? Oh, its a ball! Catch it." In addition I'd imagine that there was less time in practice on the passing game than most teams had. It does seem like Orton favored Decker more while Tebow favored Thomas so it'll be interesting to see how they respond to Manning. In rereading this comment, I wonder how much harder it is to catch catchable balls when you see more than your share of uncatchable balls. Do statisticians track uncatchable catches that are caught, as in "holy crap" catches. Seems like both WR's had a few last season. Rollston Frangopoulos I'm with Ivan - I've actually seen either Manning or a Bronco talking about how they do plan to do some no-huddle. It's all very preliminary, but it does make sense. It came up in the list of things that they do want to try from Manning's past. I look forward to seeing how they integrate the rushing game, though. Manning's receivers averaged (I was playing with it today) nearly 10 yards (or more) a pass. That also gives you a little wiggle room to run the ball on 1st or 2nd, which I like. It makes play-action problematic for the D, since you'd have to respect the run more than defenders did in, say, 2009. Indy won the SB with the bottom rated running game in the league (nfl.com stats).How they line up the OL on the split (the distance between the OL players) should be interesting. In the recent past they've bunched up on pass downs frequently and opened up on run downs. It can be too much of a tip to the defense. How the passing game from Manning changes that (or doesn't) is something I'm looking forward to seeing. Very interesting stuff Doc. Great read as always. Chris Bailey Chris, I'm talking about a guy that caught Tebow's passes in college. I don't recall his name, but it has nothing to do with the pros other than TT seemed to have trouble with guys handing his passes. It was prior to the draft. PM's no-huddle is intended to keep defenses on the field, limiting the options of the opposing team. It's shape in the Denver offense is not yet disclosed, but will assuredly attempt to accomplish at least (probably more) two things: 1) to limit the opposing teams ability to package substitute; and 2) to force the opposing team to expend huge amounts of energy ( in high altitude and in hurry-up offenses) to control the Denver offense (theoretically a lost cause). The point being to undermine two huge opposing teams attempts at control - down and distance adjustments and overall conditioning. I'm really excited for this season to get going to see what we have. I think it'll be good. One question I have though, is where has the Broncos organization indicated that the offense will be running a no huddle? I keep seeing it said here and there and everywhere, but I haven't seen it from the horses mouth (pun intended). I think it's fairly presumptuous to say that just because Manning has run the no huddle in the past that he'll run it here. Fox is a conservative game planner on offense typically. Also, I'd like to point out that Manning's no huddle is different than a 2 minute drill no huddle. They still huddle up quite often, they just get in and out of it faster than most teams in order to give Manning more time to read the defense and put players in motion and change the offensive call if warranted. Please correct me if I'm wrong or if I've made an incorrect assumption. Great writeup. It will definitely be very interesting to watch the progess of Deck and DT with Manning at the helm. I agree that Tebow was a factor with the drops. I know Tebow's a touchy subject for some, but let's be honest receivers are going to catch tight spiral passes more consistently than wobbly knuckleballs. Tebow had his strengths, but throwing a tight spiral was not one of them. Anyone whose ever played WR, even at any level will tell you that it sure helps when your QB throws a nice ball. It's not rocket science. By the comments it's apparent how much you touch our interrests. One thing you highlight is how difficult it is to analyze what PM does to the Broncos passing game. Most of the comments have focused on Decker and Thomas, as could be expected. They're gifted and talented, and last year with TQBWSRN (I love this acronym) was an especially difficult time to evaluate their potential with the Broncos. With Tamme and Dreessen at TE, our passing game might exceed anything the Colts could mustered. If they keep 5 WR's, chosing the other three will be interesting. Willis we know. Same with Stokely. Caldwell was picked up because he had interestintg potential in two, possibly three, positions. And they could go with these three, probably will. But Dell (size and speed), Robinson (size and instincts), Hill (speed the Broncos have never had at WR), and Orton, (size and agressiveness) are IMO worth a second look. I hate to admit it but I've already dismissed Goodwin, Grisham and Page (probabl a mistake). TC will answer the question of whether Willis, Caldwell and Stokely are solid "ins", or whether the rest provide interesting skill sets that PM can utilized with especially effectivenessw. Thanks a million, this is what I call instant gratification! As I suspected, we should take the drops of passes thrown by TQBWSRN* with a grain of salt. Still I feel our TEs are going to get a lot of the passes that were thrown at WRs last year, so we shouldn't count on these guys hitting record numbers. I doubt our coaching staff will ask Manning to air it out as often as TQBWSRN did. *The QB who shall remain nameless, as to avoid opening old wounds. Great article! I have high hopes for Decker and DT to take us into the future. I also have high hopes for Andre Caldwell as well...I think he could be a sleeper for us. I really enjoyed the read. Great read, Doc. It is interesting how few drops DT has coming from a football program that was more of a running program. Had his great hands been a known factor, he would have drafted much higher than #22. I guess good for us. Maybe having the steadiness and discipline that has to be there playing with PMFM will help Decker get back to his old self of very few drops. Hopefully this being his 3rd year, any butterflies of playing in the NFL should be past him. I agree with Pat Kirwan's assessment of around 150 catches between the two. Probably more than that - however - Manning will have to spread it around. Lonestar47 Yes, 3 drops in college is remarkable. On that number of passes, too. Amazing stat. You actually make the point above in your comment. Decker has no history of drops. He didn't have the problem with Orton, either. Tebow's passes were simple very hard to catch. I know - some people hate to hear that. Doesn't change a thing, though. Decker is a very fine receiver - always has been. Unfortunately, Tebow wasn't a great QB. Life goes on. As far as how long it takes for Manning and his receivers to get on the same page - I agree that it won't be instantaneous, and it will be interesting to see how long it takes. Late season? If they stay close enough to grab a playoff slot, that would be fine. Deck was catching from Manning from the time he was signed, so it shouldn't take too long with him. 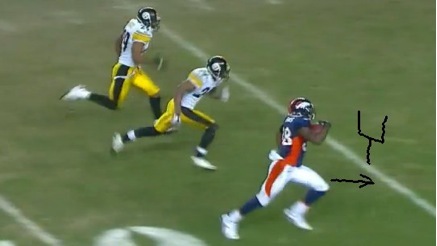 Tamme caught 67 passes from Manning in 2010 alone, so that's two targets on track. Stokley makes three, if he makes the squad. I'm moderately sure that Manning can adapt to the rest of them - the question will be how quickly. Good point. One reason that fits into your question - RH QBs throw a ball that veers ever so slightly (with most QBs) to the right. A LH QB will throw one that veers left, and some receivers will struggle with the change. That's from Timothy Gay's The Physics of Football. Via the same reference, the force vectors with a lefty are different. With either a RH or LH QB, if you throw a ball that deviates from it's normal (spiral) axis, the ball wobbles - no shock there. But with a LH, there are certain differences, according to Gay. It's not my field, but we all know that Tebow's passes could resemble ruptured ducks at times. I think that it might well simply be that receivers aren't used to the variance from a RH QB, but in any case, it's true that a serious wobble will produce some unusual force vectors, and they're different (if only opposite) a RH QB. Thanks Doc, these kids are the second biggest winners in our QB change, right behind our TEs. If you get a chance, how about a column on RH vs LH QBs, and the "catchable ball" concept? I had read once that in his time in college ED had only dropped 13 passes total, period.. That stat is remarkable your number of it being 3 is unheard of..
That said I have been very disappointed in his performance as a pro..
Not sure if it was the QB, inattention to detail, concentration or lack of coaching that cause his drop factor to absolutely soar.. I suspect it was a combination of all of the above.. There was no doubt that playing against NFL corners would have caused a lesser % but there were many games I saw him flat drop it without a CB being near enough to cause an issue.. Lets hope that he can indeed come back and be that next easy Ed we all loved in the super bowl hey days. there is little doubt in my mind that IF Manning gets in a grove with all of his skill posotion players that this Offense will be hard to stop..
May not get a TD each time but lots of gimme FG's, inside the red zone..
Each time we score puts that much more pressure on the other O to try to keep up.. Thus ears pinned back pass rushing..
My only concern is HOW LONG will it take for the O to get a mind meld with Manning.. I suspect it will take most of the year for some to get there which IF we do not get our butts kicked in the early games, we should be ready for the playoffs..
DavidInLA I think that finding out who else is on the roster will make a big difference, David. Bubba Caldwell has sub-4.4 speed but plays exclusively out of the slot. Stokley didn't win the name Slot Machine in a pinochle game, so if either guy is on the final roster (good odds), Decker will spend most of his time at the Z. This subject and the front 7 are the two biggest unknowns this season. If Denver had signed V-Jax, the talking heads & Vegas would give Denver at least 2 more wins and hand them the AFC West now. Additionally, if Denver had drafted one of the consensus top 3 DTs, there's another win that the pundits would give Denver. I'll take DT over V-Jax all day. I'll take Wolfe over Poe all day too. I know I'm definitely one of the lesser-informed fans here, so it's probably no surprise to hear I am elated reading that Decker can block. Never really knew that (although I should've). That will be very helpful in many situations. I can't imagine things getting any worse for DT or ED. To me, the college stats just show that they have "something"....but what that means in the NFL is so tough to translate. However, that said, those guys having to put up with the last two QB's, and still looking ok against NFL secondaries, I can only imagine things getting much, much better. Doc, it's really interesting that Decker has been so reliable for the deep passes. With Manning at the helm do you think Decker's focus will be the slot or do you think he'll go deep a bit as he did with Tebow? If Stokely makes the team, do you think he and Decker would be competing for the same position? DT is such an exciting player. The play you illustrated was so outstanding. He really seems to excel at getting additional yardage after the catch. Easily the most exciting possibility entering camp: DT and Decker dominating under the synergy of a healthy PMFM.